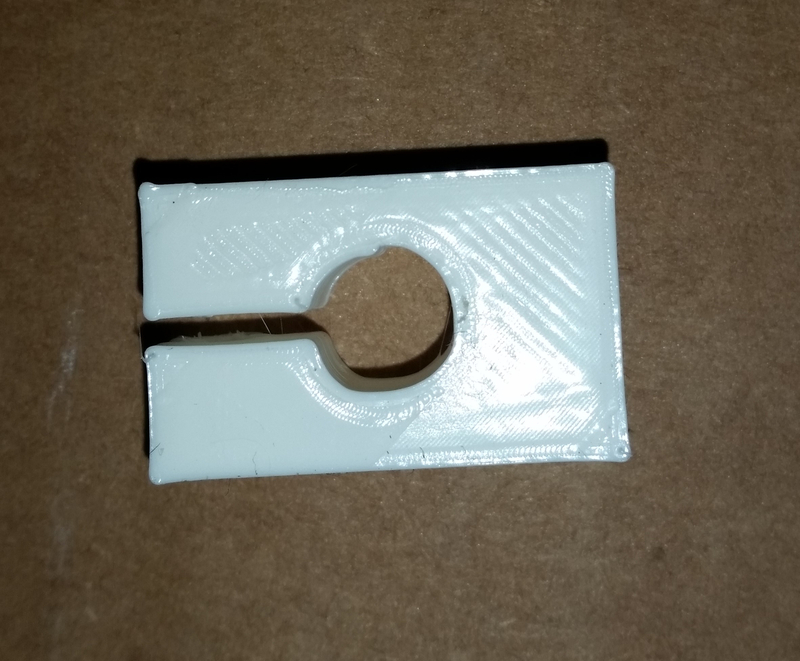 I am having an issue with printing objects that have circles in them I have tried tightening the belts to make sure that wasn't the issue. I am open to any suggestions I am using an metal frame upgraded Anet A8 duel head, with repetier firmware also using Ultimaker Cura as the slicer. Here is a photo if you look at the upper part of the circle you will see where it doesn't line up in one spot its that way threw the entire circle. Strange spot for a deviation.. Did you compare gcode to see if it is round there? Circles are always a bit of a problem regarding size, but normally look quite regular at least when printed. Also it is hard to see where it is not round. All I see is the bottom part which looks quite flattened just as if y did forget to move for some points. You should check your belts if they are still tensioned. Your bed and head need to have no play and react directly. Backlash is nothing you want. Also make sure circles are drawn slowly so you do not drag filament not bonding 100% to the inside. That is the othe rtypical reason circles are not sized correctly. Yes I looked at the gcode on a website called gcode.ws the file looks ok. That's not the bottom its the top I had ironing turned on in cura. I have tightened the belts tighter than I think they should go still having the same problem. I am begging to wounder if the cheap chinese board that came with the printer could be the issue I was planning on upgrading the board anyways so I think I will do that and see if it takes care of the problem. The down side is I want to go with a 32 bit board and I will not be able to stick with Repetier firmware is there any plans in the futcher of making a 32 bit compatible firmware? Repetier-Firmware works with 32 bit due compatible boards like RADDS. But there are also 32 bit boards with different processors that won't work. I have been looking at the part with a magnifying glass and the deviation in the print during a circle is every 1/4 of the way around the circle I have a complete arduino and ramps 1.4 that I'm going to try before buying the 32 bit board just to see if the KFB2.0 is the problem I will post the results after I get it switched over. Just an idea, but is the motor current set right? If not it might not hold microsteps. If you get patterns is is a systematic problem. But you should also see other errors happen. Yes the current is set right I used my meter to set it with I only have the problem on round objects I printed a small ball which lets you really see the problem. I finally had the time to switch my board over to the arduino 2560 that I have and it definitely was the KFB2.0 causing the problem perfect circles now. Good that you solved it.